In my early 40’s I developed a passion for gardening. Unfortunately, my gardening mania developed after my husband and I bought a house with a tiny backyard. We liked the house, which was certainly big enough, but the yard was a postage stamp. I longed for more space. Container gardening just doesn’t do it for me. So 17 years ago we bought a house with a large lot. Like true Philadephians, we moved just a few blocks. Philly folks tend to hunker down in a neighborhood and stay there for life. I love my Mt. Airy neighborhood and have lived here for almost all my adult life. This was my dream come true--a big Mt. Airy garden. The lot had an overgrown perennial garden. Maybe it would be more accurate to call the flower beds weed patches with a few perennials as accents. The perennials that survived were the real tough customers—-Siberian iris, perennial geraniums, phlox, rudbeckia, orange daylilies. And many of them are still in the garden (even some of the orange daylilies providing easy care, dependable color). At this stage in my life, I am so glad I did not get rid of them and replace them with fussy, demanding, over-hybridized plants. 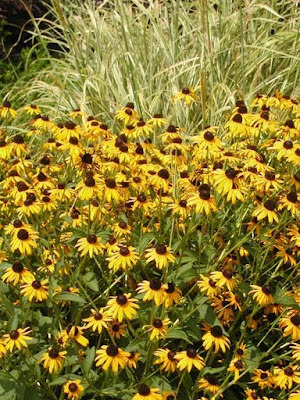 I thought a lot about maintaining the garden as I got older and decided to replace many of the perennials with shrubs. 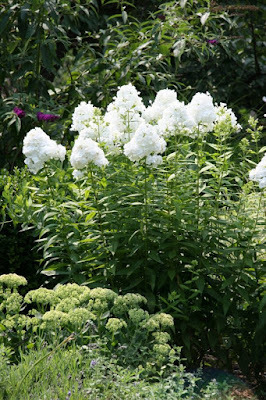 You can get a lot of flower power from shrubs and some like hydrangeas bloom much longer than any perennial. And, unlike perennials, shrubs don't have to be dug up and divided every few years. For late winter I have witch hazel and fragrant honeysuckle (an ugly shrub but with fragrant flowers to die for and in February no less.) I have quince in March, purple sand cherry in early April, lilacs and azalea in late April and early May, rhodies and viburnum in mid-May, mountain laurel in June, lots of hydrangeas which begin in mid June through late August, crape myrtle in late summer, camellia in late October. They are all easy care (except for the camellia). And unlike perennials, they don't die back to the ground every winter. Instead of bare ground, I have all these woody plants, plus lots of hollies with glossy green leaves and berries most of the winter. So what’s the downside? Here I am—-a mature gardener surrounded by all these mature shrubs. But my energy is waning and they are all (thanks to all the compost I’ve added to the soil over the years) flourishing. The shrubs are getting enormous and crowding the remaining perennials. I control for size by cutting back. This is easier than digging and dividing perennials, and it helps to have a male friend or family member around. My husband doesn’t share my passion for gardening, but he really enjoys hacking away at the over grown shrubs. When my son comes to visit, the only garden work I can get him to do is chopping down branches. They both always look happy and energized when they are chopping away at the shrubs. (This is the garden chore I like least.) I'm convinced there’s a gender difference here. So my garden advice for anyone getting on in years (or anyone who wants a low maintenance garden) plant the tough customers and plant lots of shrubs in your perennial beds. Any more ideas from other sixty something gardeners out there? Stay tuned: More old age gardening tips to come!